Unlike simple, traditional swivels--which do not rotate under load--these swivels are equipped with tapered roller thrust bearings which means they rotate freely at all times. 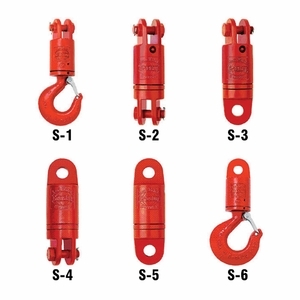 They are suitable for frequent rotation under load, but be sure to contact your wire rope supplier to ensure the swivel you plan to use is compatible with your wire rope. All swivels are individually proof-tested with certification. 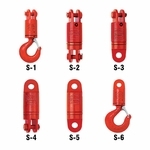 Hook models include installed safety latches, and jaw models include bolts with nuts and cotter pins. Pressure lube fitting to keep your swivel in good working order. Safety factor of 5:1. If you need a larger size or specially-designed swivel, contact us and we can get with the Crosby engineering department and have something built just for your needs.